Exciting. Cool. Interconnected. Entrepreneurial. Engaging. And how about, amazing! Those were just some of the words used to describe designs for the new home of the Tepper School of Business, the first project slated for the Tepper Quad on the Morewood parking lot site. Beautiful computer-generated renderings for the 295,000 square-foot, five-story marvel with underground parking — yes, parking for 200 — were recently unveiled by the project team, including Tepper School Dean Robert Dammon, faculty rep Bryan Routledge, architect Buzz Yudell, Associate Vice Provost for Campus Design and Facility Development Ralph Horgan, and Director of Design Bob Reppe. But, before the stunning images were revealed, Dammon reflected on the significance and impact the new building and location will have for the business school. “It’s much more than a building, it’s a new vision for the business school of the future,” said Dammon, who noted that business schools are usually built on the edge of campus to keep their students focused on strictly business. Dammon said the b-school also must be a better asset to the campus. “We’re moving from the edge [of campus] to the center, not just physically, but intellectually as well,” he said. Yudell called the project, which aims to set the stage for future campus growth to the north, an extraordinary opportunity. Yudell is a principal of Moore Ruble Yudell Architects and Planners of Santa Monica, Calif.“As a design team, there’s nothing more exciting than to make a physical place that supports, enhances and nurtures the ongoing vision and mission for the school and the university. We’re designing for today, and 10, 20 years from now,” he said. Yudell outlined several key principles the team used to shape their work. Among them were creating a hub for campus; enlivening campus life with mixed uses; energizing collaboration and innovation; creating domains for undergraduate and graduate students; and integrating technology to support the delivery of curricula. He said this “Tepper School Plus” would be welcoming, “green,” flexible, adaptable and sustainable, providing diverse, rich, multi-program experiences with many choices. He said it would be grand and intimate, lively and quiet, public and private. “A rich ecology is one that is diverse and changing,” he said. The attractive sculptured exterior of the building will consist of the Hornbostel cream-colored brick and glass with porches and bays. He said by using the architectural history of the university, the building speaks to visitors, in a way, telling them that they’re in a beautiful setting and entering into the CMU district. Interior spaces will be flooded with natural light, warm fabric furnishings and wood to promote collaboration and interaction. Yudell said the inside would be lively, even the stairways. He called the wide ergonomically sound stairways, “social stairs” that encourage people to be active. “Sitting is the new smoking,” he said. 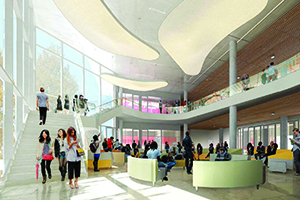 The ground floor and first level off of Forbes Avenue will include an 18-foot high atrium inside the front door, a 600-seat auditorium that can be reconfigured into different sizes, a Technology-Enhanced Learning Center, a fitness center with locker rooms and showers, and a welcome center. The second floor, accessible from the entrance facing the Cut, will include several dining options, such as grab & go and various cooking stations. “Food is central to the life of a building,” Yudell said. 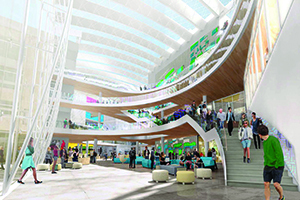 Levels two and three will contain 18 classrooms and flexible academic support spaces, an undergraduate and graduate student commons area, breakout rooms and collaborative areas, and an Entrepreneurship Center. Classrooms will be equipped with technology for production and linking to CMU campuses around the globe. The fourth and fifth floors will be used for faculty, Ph.D. and staff offices and meeting space. Yudell said there would be a “faculty neighborhood” instead of a faculty lounge. “Faculty have given up having a faculty lounge in favor of having spaces between offices to become part of a mixing bowl to generate interaction and make it a unique place,” he said. Dammon said the space would draw the campus community in. 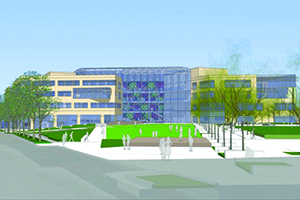 Designs for the new Tepper School of Business, the first building in the Tepper Quad, were unveiled at a Town Hall meeting. (Top photo) View looking northwest from the "Cut." (Middle photo) View of Atrium at the entry. (Bottom photo) View of the planned Graduate Commons.